50 days ago, on September 1st, Iraqi forces under the direct command of Prime Minister Nouri al-Maliki stormed camp Ashraf, massacred 52 people and abducted seven others, including 6 women. 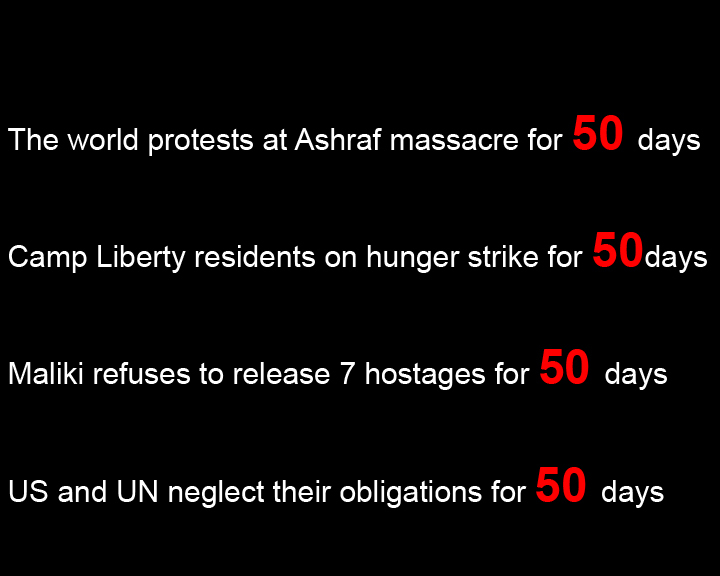 It is now 50 days that the hostages are under the threat of being extradited to Iran. It is now 50 days that Maliki falsely denies having taken part in the attack or having the hostages in his custody, despite the countless documents and facts that prove otherwise. 50 days ago, the residents of camp Liberty started their hunger strike in protest to the attack on camp Ashraf, demanding the immediate release of the seven hostages and the protection of camp Liberty residents by UN. It is now 50 days that they haven’t ate anything, and their health is deteriorating at an accelerating pace. But they insist on continuing their hunger strike until their demands are met. 50 days ago, if the US and UN had stayed true to their pledges and commitments, this disaster could have been prevented. It is now 50 days that the world is calling on the US and UN to act according to their obligations and put pressure on the Iraqi government to release the hostages. It is now 50 days that they haven’t taken any concrete steps to remedy the situation, and their inaction is endangering the lives of the seven hostages and the residents of camp Liberty, who are at the risk of further attacks by the Iraqi government and Iranian regime’s terrorists. Previous Previous post: Have you heard of hostage-taking of my innocent mother in Iraq?